As usual, everything was going according to plan, when an earthquake comes along and wrecks my estimates. 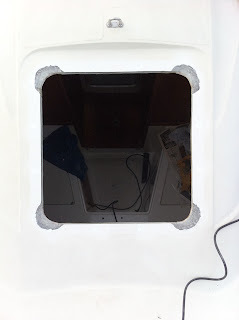 In this case, it involves the bow hatch installation. The original hatch was beyond salvage (or shall I say, the necessary ambition and effort). I chose a Lewmar Medium Profile Series 60 hatch as a replacement. What I had planned for a day of work turned into an aggressive week of work with many nights under the halogen work lights at 11pm. Wish I could get this boat into my driveway! The Lewmar 60 is very close in required cutout size to the original hatch, falling just under the required dimension. I thought I might just get away without having to shim it, but as it turns out I needed to build up a little bit all the way around. I'm guessing about 8 layers of 10oz. cloth will do the job perfectly, which isn't too big a deal. Unfortunately, there was an additional detail which did not enter into my planning when I purchased the hatch. The Lewmar's corners are rounded, not square. Ugh. In order to get a proper structure and seal I needed to build out a core and laminate to match the new hatch's corner radius. That's a lot of fiddly time consuming work, although not particularly difficult in and of itself (at least now that I've been doing glass work for almost two years!). I began by making a corner template out of some scrap cardboard I had hanging around the boat. I simply traced out one of the corners, cut it out, and verified that all corners matched it on the hatch. Next, I used that template to cut out four pieces of 1/2" balsa core on the shape of an "L" with the appropriate radius. I used a Dremel tool with a small router bit (perhaps a #654? not sure...) to rout out the core material between the top and bottom laminates. This made a nice channel to set the new core blocks into. Next, I wet out the corners lightly with un-thickened epoxy as called for by all the West Systems guides. Then, I mixed up a batch of epoxy thickened with colloidal silica, although high-density filler would be excellent as well. I went for somewhere between mayonnaise and peanut butter consistency. After buttering up the balsa pieces and the recesses, I pressed them into place, filleted the edges, cleaned up residue, and let it fully cure. Next step was to grind out a beveled surface inside and out (both sides of the deck) at each corner. You can see from the picture approximately what the shape of this grinding looks like. I made it as uniform as possible. I ended up laminating 8 layers of 10 oz cloth first. Each piece was approximately 1/8" smaller than the previous to help match the taper. I also left a little fuzz hanging over the balsa core edge which I'd clean up later. This leaves a strong edge as the cloth tends to fray during handling, especially on tiny pieces like these. After grinding the 8 layers to a more uniform surface, I surveyed the repairs. Three out of four needed a little piece or two added in various shapes to help bring the profile to its needed shape. I then gave these a kiss with the grinder to smooth things out. The next step is to add the long laminate shims to bring the edges out to match the corners. This is another set of 8 layers, again with 1/8" tapers. This time I built up smaller to larger as I was less concerned about bonding surface do to how little load these will carry. I just wanted the smoothest possible end product. It took forever to cut out the 32 18-19" x 1-1/8" strips, but again, it's not very hard to do, and luckily I could do this at home to prepare. My final touch is to lay down gel coat in the new corners as some of the repair is exposed. I also needed to drill and fill the original hatch mounting holes as they are exposed when the new hatch is installed. So, another set of gel coat repairs to do. After installation, the hatch cut out was finally the correct dimension for the new hatch, and a normal installation could proceed. At the moment I'm leaning towards through-bolting the Lewmar hatch rather than using wood screws as CS originally did. Although I'm not a fan of having those bolts exposed below decks, it is a more seaworthy installation. 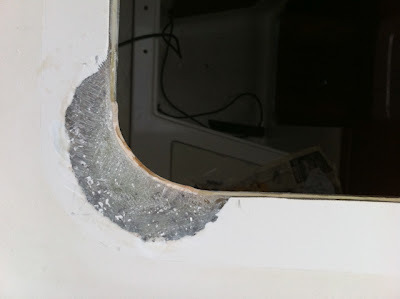 I'm not worried so much about the hatch being ripped off the boat, but I noted significant stress cracking around the original surface mounted holes with some being pulled up almost 1/16". Based on these observations I'm not convinced that a surface mount is adequately reinforced. Perhaps a good epoxy potting job will make a difference here. I can always go back and through bolt if I notice any signs of fatigue. I'm hoping to complete this installation over the weekend, so I still have a few days to noodle this idea around in my head.